Don't know about you, but I'm about ready for spring to come. As a snow fan I feel we got excellent value from this winter, but its time has passed. (Even if Little Dude is still asking for snow every single day.) Spring, however, seems to be having a bit of a diva moment and after just peeking through the curtains, is fanning itself in the wings and declaring it is COMPLETELY UNPREPARED and maybe everyone should just go home. Well. Perhaps it's just as well, since I have two new patterns to share with you, and they're eminently suited to this chilly spring weather. 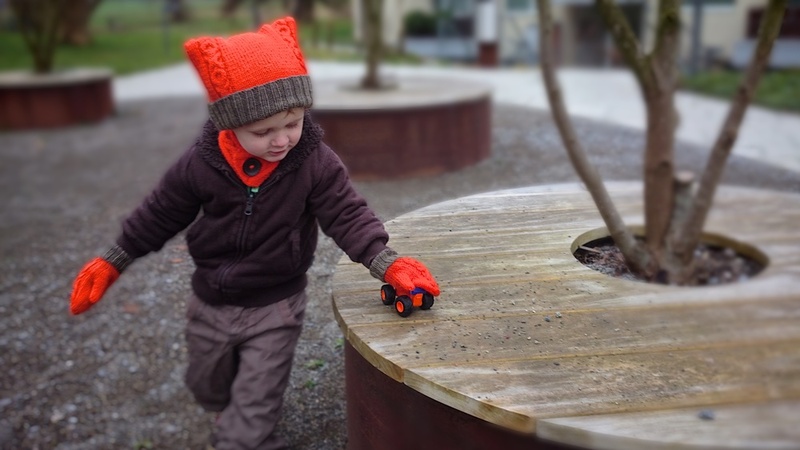 In winter, kids need waterproof mittens, and all bundled up in snowsuits there may be no need for a scarf. But in spring, when even direct sunshine is only a temporary and unreliable reprieve from the ice still in the air? Bring on the woollies. Scarves, I find, are a problem for toddlers. They need something for that cold gap above the jacket collar, but scarves fall (or are tugged) off. Cowls have to be big enough to go over their enormous noggins, but then they need to be tucked and held and arranged to sit close to the neck, and that's a recipe for trouble. Hence the buttoned collar. Just big enough, doesn't create any unnecessary bulk, and stays just where it's needed. Hat and mittens complete the set (and you'll find knit mittens are much easier to put on than the bulky waterproof kind, in which thumbs get so lost). These little moppet warmers were designed to complement the Kissable cardigan – which can be made as a full cardi, or a sleeveless vest. I love vests, especially for brand-new babies; it's the perfect layering item. But sometimes a person just needs sleeves. So I gave you both options. I like options. And I love colour combining. Whatever yarn you're using, whether you're making a one- or two-colour cardi, I would strongly encourage you to go stash-diving and find a remnant in a contrasting shade, just enough to cast off the buttonband – you'll be amazed at how it adds zing to the whole garment. Much like buttons (aren't Lorna's wooden ones gorgeous on the vest, above? ), smart colour choices lift a project from good to irresistible. Especially if, like me, you could use a little lift while waiting for spring to really kick in. The accessories set is €4.99, the cardigan €3.99 – or you could get both for €6.99. For a vest, cardigan, hat, collar and mittens, I think that's pretty great value. And they're fully toddler approved! Little Dude loves his hat so much, he... um, he wants to wear it over his whole face. I don't ask questions. I just take the pictures. As professional model behaviour goes, this is perhaps not entirely helpful. But it's hella cute anyway.